Bookshelves are like money: most of us never have enough. The storage space they provide is rapidly claimed but seldom relinquished. People are loath to give away books (even those they infrequently read) the way they do clothes or other possessions. People who use home offices want and need attractive furnishing. 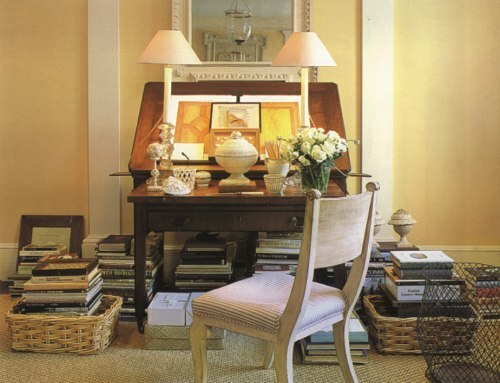 People choose to inject their home offices with personality and individual style. Books can play a key role here. Bookshelves can camouflage a multitude of decorating sins. 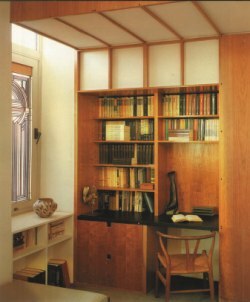 An old door, a poorly designed window can be relieved if you place bookcases against them and add height and symmetry. Think creatively about the height and shape of bookshelves; tall floor-to-ceiling units, long horizontal shelves and long horizontal shelves are ideal partition figures, and freestanding etageres can add structure to a room. A bookcase can also be a showcase. If you don't have enough wall space to display your art collection, don't be afraid to use your bookshelves to flaunt those paintings. 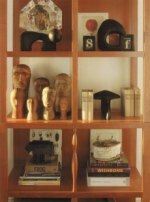 Be very careful about how you balance books with art though, too much can lead to clutter. The space under the staircase can ideally be used to store books. Small duplex apartments care rapidly gaining popularity amongst urbanites today. You can easily set up your home office under your staircase. A compact bookshelf and a tiny PC table can easily create a cozy atmosphere. If you don't have bookshelves, think of a different solution for storage of books. Baskets can niftily serve the purpose. Of all furnishings, bookshelves are amongst the easiest to build, so the range in their sophistication and intrinsic value is great. 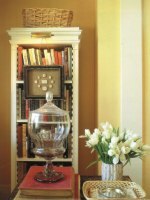 For those who love to read, books add warmth and familiarity to any room in the house.